Material: Fur Sponge Oxford Cloth. Pacagke: 1 House Cat Mouse. pet bed -Fit for a King (or Queen). Easily change fabric to match decor. pet bed -Fit for a King (or Queen). Easily change fabric to match decor.. Condition is Used. Shipped with USPS Priority Mail. This is the easiest, simplest design on the market. Light and portable. Will not collect water or debris. Pacagke: 1 House Cat Mouse. Material: Fur Sponge Oxford Cloth. Spoil your beloved pet with this plush crate dog bed. So comfortable, you will be tempted to curl up yourself. Your dog will never have to run around looking for a spot to lay down. The plush inside pillow is removable for easy washing and can be flipped over for black color. Set includes:1 Pet Bed. 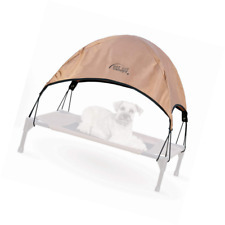 Shade & comfort for your pet. This portable pet bed house can be easily moved from location to location with you and can be enjoyed anywhere. Outdoor Wicker Dog Pet Bed With Shade Roof. Give your pet dog or cat a comfortable place to sleep close by you when you are outside in your Garden, pool or relaxing in your yard. The bedding, canopy, and pillow are made out of a light-blue cotton-silk material. It is well-sewn with lining and has a plush quilt feel to it. It is accented with beautiful white lace. There is one small tear in a piece of lace on the lower bed sheet. A comfortable house is very important to humans. So is it to the pet. We will introduce the Super Soft British Style Pet House Size M to you. In addition, the house is made of good nylon and polyester, eco-friendly and practical. Improvements Indoor Outdoor Pet Bed Shade Cover Medium Item # 382933 Nautical Blue ~ New Con. In Package. This is the easiest, simplest design on the market. Will not collect water or debris. Spoil your beloved pet with this White and Gray plush crate heated bed. Designed for indoor use, Internal Thermostat automatically regulates the pads temperature at an average of 100'F (37.8 C) for optimal comfort for your pet. Stunning curves and a rich copper finish are the highlights of this distinct and distinguished canopy bed. Beautiful canopy design. Bed Design Canopy Bed. Brushed dark copper color. Finish Copper Finish. K&H Pet Products Sturdy Cooling Cot Elevated Bed Large Gray Blue 30" x 42" x 7"
Functions as intended. Moderate wear: scratches from previous dog use. Very clean. Keep this in mind when buying an item as a gift or if you are a collector. This will include powering on the unit and checking all the major functions. 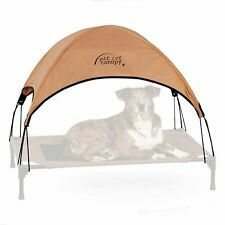 NEW K&H Pet Products Pet Canopy Tan Large 30" x 42" x 7"
Handmade cat bed. Wood sticks the base of bed. Bed up from the floor. 1 x Pet Nest. Adopt soft warm cotton cloth on the wall, washable and durable. Lovely strawberry style, simple but good-looking. Best bedroom or resting place for your pet dog or cat. Create a comfortable bed for your pet's healthy sleeping and rest. Cream colored soft, fluffy handmade blanket. Cute wicker bed with canopy cover. Wicker Pet Bed with blanket. A happy pet is waiting for this gift! 20" across, 18" tall, 12" depth. One small wicker piece missing (see photos). Middle beams provide for added support for your furry friends. Q: What's the pet cot made of, is it sturdy?. Q: Where can i use the pet cot?. You can place it in the bedroom or living room, out on the back deck, or in the yard--wherever your pet prefers. Custom made pet canopy bunk bed with ladder to top bunk, wood( refer to photo) Lockable wheels attached on bottom. Pet Ladder is removable. PET DREAMZ 🐶🐱 ARE MAIN FOCUS IS CUSTOMIZED BEDDING FOR FUR BABIES TO SLEEP IN STYLE. Then a suitable pet nest is one item to consider having in your house. Featured with unique strawberry style appearance, this nest is pretty cute and elegant. Show your love to your pet from it! 1 x Pet Yurt. Uses standard size bed pillow, not included. CROWN COURT CANOPY PET BED. Reward your good boy or girl with a dog bed designed to keep them comfortable no matter the weather. This dog bed provides only the best for your best friend. Tent Space: 19"(L) x 18.5"(W) x 21"(H). Spoil your beloved pet with this plush crate dog bed. So comfortable, you will be tempted to curl up yourself. Your dog will never have to run around looking for a spot to lay down. It can be used inside or outside, with a water resistant, non slip poly canvas base that is perfect for any surface.